I had a friend inform me that I was eating my apple "all wrong" the other day. I thought she was losing her mind until another friend posted something on Facebook this morning. 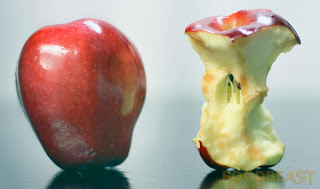 Take a look at this Eating Apples All Wrong, and then report back if you are also a "waster". I'll be the first to admit that I have never eaten an apple this way but I will for sure try it!